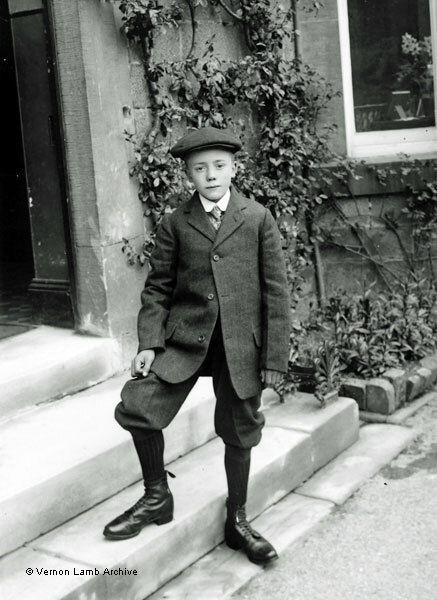 Description/Historical Information: Walter Frederick Woolston is standing on the steps of St. Andrew's Home, a Church of England Waifs & Strays home. He was born in Lambeth in 1900, the son of Arthur and Alice Woolston. By 1911 he was boarding at Troston, Bury St Edmunds with the Matthews family. He left Liverpool on the Victorian on 29 April 1914 as a 3rd Class passenger to land at Quebec (Contract ticket no.57768). There were many boys of the same age on the ship, including a few from St. Andrew's [also see VLA4867, and VLA5230 and VLA2536].